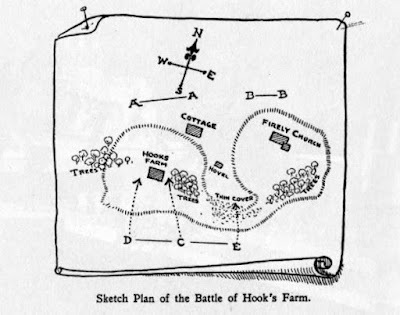 For anyone unaware of the significance of The Battle Of Hook's Farm, see this link. H.G.Wells' original map is shown below. McHook's? Well, I'm working on a project at the moment to adapt Honours of War for the Jacobite Rebellions of the 18th century in general, and the '45 in particular. It turns out Stuart has a fine collection of 30mm figures for this period, of both sides, so we are now working on things together. For this purpose, Stuart had set up a terrain based on Hook's Farm on his dining table (6' x 3') so we could have a little play test of the ideas I have produced so far. I only took a few snaps of very average quality, so I can't show you an overview of the table. The Government forces (Stuart) were 2 regular battalions, 1 battalion of inferior militia, a regiment of dragoons and 2 light guns. They were set up on the northern table edge. To the south, the Jacobites (myself) were set up with 6 small Highland units, 2 small cavalry units, and 1 light gun. Only 2 of the Jacobite units were given muskets, and these (the ones on the right and left of the first line) were allowed to be superior, although their firing would be classed as inferior. 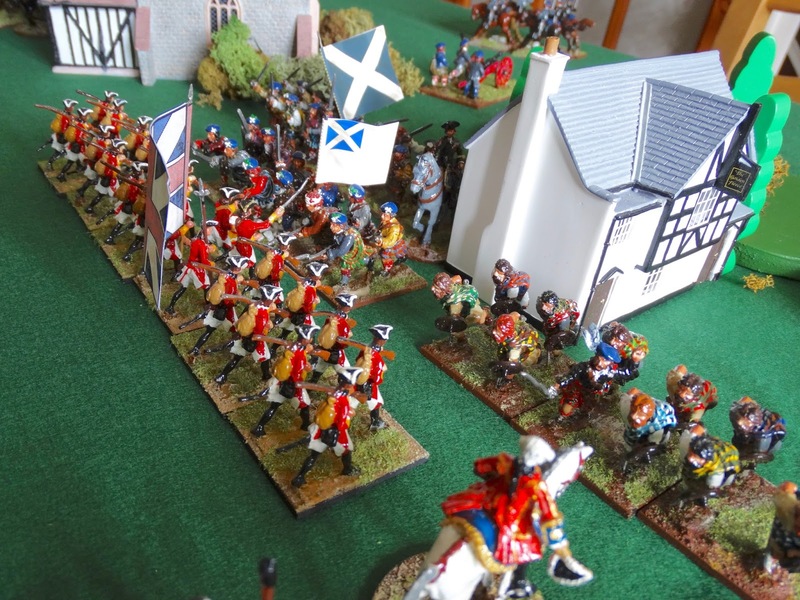 The battle turned out to be something of a re-run of Prestonpans. 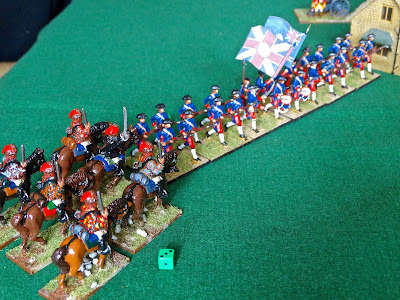 If I may say so, Stuart made the mistake of advancing forward with his regular battalions, temporarily isolating them from the support of his artillery and militia. When the inevitable Highland charge occurred (surging forward either side of The Hovel Public House), all 6 Scots units were concentrated against the regulars, with 3 attacking each battalion, led of course by the musket wielding superior clansmen. The Government fire was not as effective as it might have been, and in the melee that followed both Government battalions, well..., ran away. 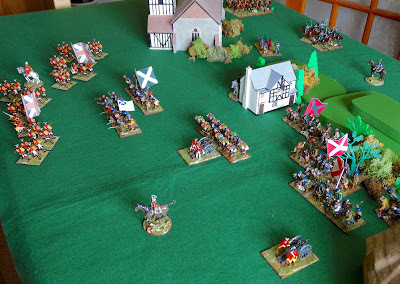 My current rules allow the Highlanders a significant charge bonus, and when added to the modifiers for supporting units, the redcoats were simply overwhelmed. Stuart, gentleman wargamer that he is, pronounced himself pleased with how things had worked. The 2 regular battalions were outnumbered and had fired poorly, and the result seemed fair. The main trick I need to accomplish is to balance the ferocity of the Highland charge against the defensive capabilities of the British line units, so that, as quality and numbers on both sides are varied, a series of plausible results occur. Then maybe we can re-fight some actual battles and see how they work out. Below are a few snaps, with a little commentary on how things progressed. 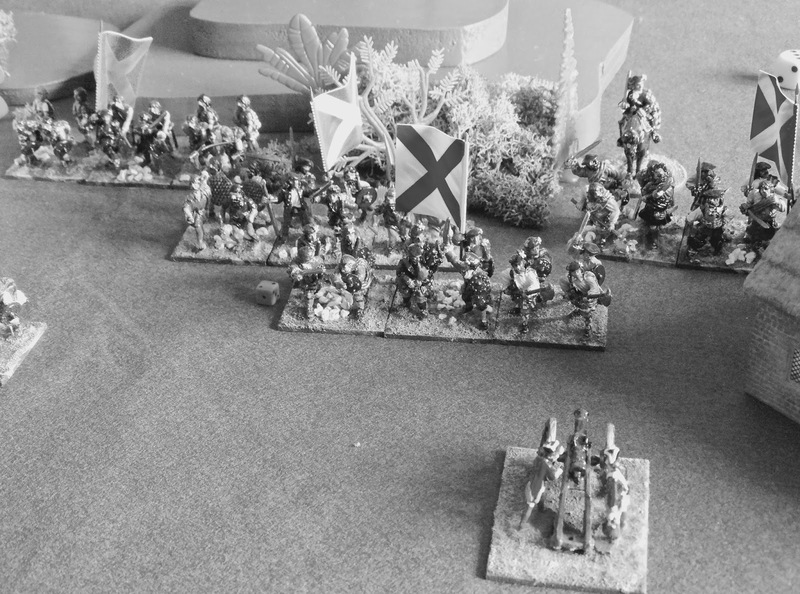 The Highlanders crash into the Government left flank infantry. HoW dictates that in this situation, one unit melees hand-to-hand whilst the other 2 act as support. overwhelmed by both numbers and the aggression of the Highland charge. A bit of black-and-white old school flavour for you. One of the Government guns is feeling rather exposed as the supporting infantry disappears. Government right flank and charge the hapless militia. 'The Cottage' is seen top right. The Government Dragoons try the same thing on the opposite end of the table. 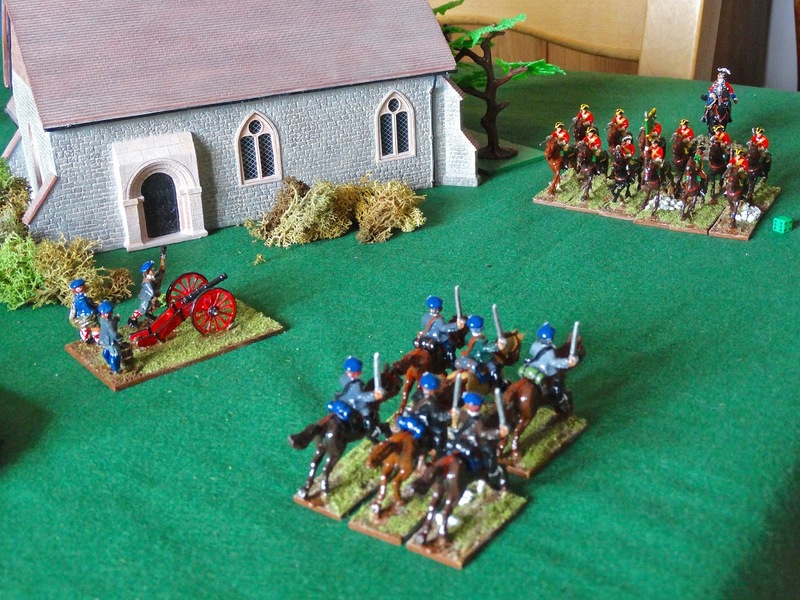 They find themselves faced by blue-bonneted Jacobite cavalry supported by the Jacobite light gun. This encounter could have gone either way, but we left it there as the game was effectively over at this point. Firefly Kirk in the background. 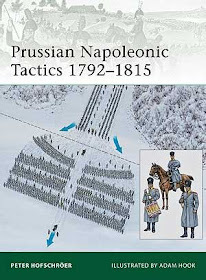 Although brief, this was an instructive engagement that supported some of my adaptions so far, and also showed up areas where I had not thought through all the possibilities (for example, the question of Highlanders pursuing following a successful melee). A great pleasure as well to have Stuart's lovely figures to use. Great to hear that you are progressing well with the '45 and to have Stuart aiding your efforts is excellent news. I must say that those so called 'old school' figures have a real charm about them and take me back to my early days of wargaming with a few Airfix soldiers and any scenery we could cobble together. Really looking forward to more updates on this in the future. Delightful! 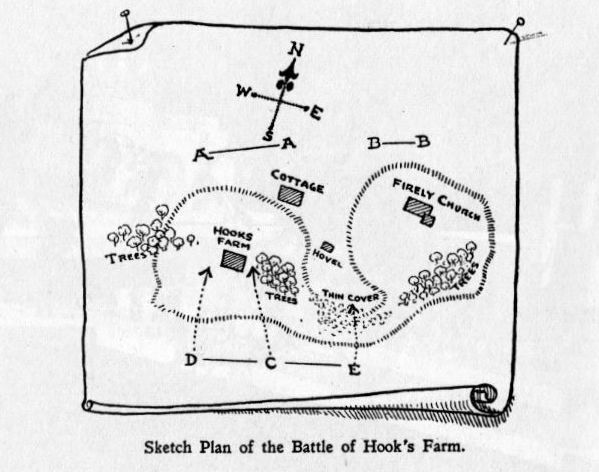 Hook's Farm, like Grant's Sawmill village, is a scenario that always seems to come through. Nicely written Keith, as you say, we have some interesting projects on the go at the moment. Holger Eriksson, as indeed are all the figures in my 7YW(-ish) army. Stuart - apologies! Give me time and my soldier identification will improve. Always interesting to see a classic in a different light. Thank you.